Watching your beloved pet grow old is bittersweet, but their memories will still live on through these adorable gifts for dog lovers. Cherish every moment with them, and be sure to take lots of photos as these can be made into stunning pet portraits, or even a mug or two. You’ll be bringing photographs to life with a unique, personalized pet portrait from ArtSoulCreation. Once your painting is made, the seller sends you a digital print of it, meaning you can have it printed on any media you like, and as many as you choose, so you can even have it turned into adorable keychains. Personalized with 40+ dog breeds available, they’ll cherish the holiday photos they take and memories they make while getting tacky with their elder pup. Dog moms are obsessed with these dog mama tees, personalized with the breed they love the most. Know a beagle mom or dad? Surprise them with this simply precious Personalized Beagle Mug. Each aspect of this mug can be personalized, from the dog(s) name, coat color, and pattern, to their owner’s name, hairstyle, color and even their clothes. The mug would make the perfect coffee companion or a lovely keepsake. You can’t have such a gorgeous mug go without a coaster now, can you? Especially these cute personalized photo marble coasters. Remember fond memories with your lovable family pet, and have them printed onto these coasters, so you can smile and reminisce as you relax with your hot beverage. The dog obsessed will love this Lily McGee Embellished Notepad. It’s printed with the cutest fluffy pup on the front, with the phrase “my best friend is the one who brings out the best in me” – isn’t that just lovely?. Keep memos, write shopping lists, or even use them to write letters to pen pals. If you like the way watercolor paintings look, then why not get your pet their very own hand painted portrait? They’re great for capturing character, and all of the kookie things that make them, like sticky-out tufts of fur, their gorgeous eyes, or their dribbly tongue. Frame it for a heartwarming art piece. Do you have a poodle? If so, you NEED this quirky shirt – there’s no better way to parade how proud you are of your fluffy friend. The shirt reads “the best decision I ever made was adopting a poodle” and you can have it made in your favorite color, too. Already have a few too many photos? Then why not turn your favorite into a stunning framed silhouette; it’s sure to be an eyecatcher for all the right reasons and have everyone chatting about the lovable pet. You can have it made in any color you like, and it’s perfectly finished off with their name. With this Ultimate Pawprint Keepsake Kit, you can keep a cherished memento of your pet forever. The kit comes with enough clay for 2 keepsakes, as well as a display stand, letter and number customizable kit (for names and birthdays), and 3 ribbons to decorate them, or to use for hanging. This utterly gorgeous gift for dog lovers is bound to be greatly appreciated. Keep their memory alive with a super delightful Custom Pet Portrait. With this listing, they send you the file, ready for you to have printed however you like, whether it’s onto a canvas, phone case, or simply to hang on your wall. It’s bittersweet watching your pet become wiser, older and begin to slow down. Though don’t fret, because you know you’re giving them the best life possible, and a sweet way to remember that is with this “I will love you forever” personalized dog portrait. Send a photo and they’ll transform it into a captivating picture. Celebrate the parts of dog ownership that make you laugh and smile with the My Dog Memory Book. The book comes with 24 beautiful pages, illustrated with cute pups, sentences, and spaces for photos to fill in, ready for you to look back on whenever you need a pick-me-up and to remember the good times. Take your beloved furry babies with you everywhere with this sentimental Personalized Pet Lover’s Necklace. The pendant is hand stamped with up to 19 characters, plenty enough for your pets’ names, and it also has a cute paw print in the middle. You can choose to have it placed on a cord necklace, too. There’s no doubt; if you’re obsessed with your dogs you’ve probably got way too many photos already, so have their adorable faces turned into a personal, custom magnet – that way every trip to the fridge or noticeboard will have you smiling fondly, for sure. This artist captures all their funny, quirky features perfectly. With this Dog Pillow, you can have your pets drawn and printed onto your very own cushion. Ready for snuggling up with when you miss them, or just have placed on your sofa or bed, to look at and know they’re always going to be with you, as all pets live on in our hearts. Whether you have had your dog since they were a puppy, or you adopted them later on in their life, you’ll know that while puppies are amazing, they become even more affectionate and funny the older they become, which is why “senior dogs are the best dogs” – just like this sweet shirt says. Carry them close to you with this dear personalized pawprint necklace from Bellezamia, over on Etsy. 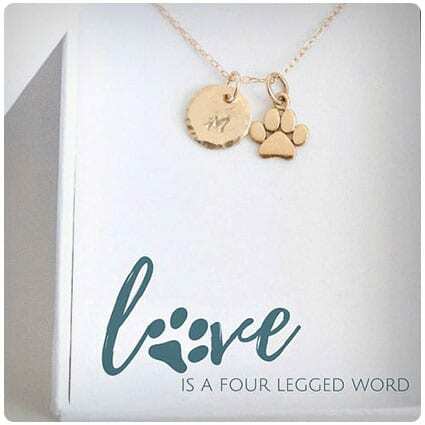 The necklace includes a pretty pawprint pendant, as well as another that has your much-loved pet’s initial, which you can choose to have in either gold or sterling silver – both will complement any outfit, perfectly. Need something to cuddle when you’re missing your pup? Get an adorable pillow made from DesignMyDog, with your favorite portrait of them on, and you can snuggle up with it whenever you need. Plus, we all know dogs are super cute, so a pillow with them on will definitely brighten up any room. With the Pearhead Paw Print Keepsake Photo Frame, you can use air-drying clay to create an impression of your pet’s pawprint, and display it alongside a precious photo of them, inside of a beautiful wooden hinged frame. Have it at home for the whole family, or you could place it on your office desk, instead. Have your dog digitally oil painted and put on a colored mug of your choice, as well as their name, written in a pretty font. This will make a wonderful gift for dog lovers as they can use their mug at home, or even at work so they always have their pup by their side. If you don’t work in an office, you probably don’t have a place to display family (and pet) photos, but you can still pay homage to your four-legged friend with this Paw Embroidered Baseball Hat – wear it while at work, hiking or just for casual wear, and you’ll be sure to remember your special pet. There’s no more perfect gift for the dog lover that also loves bikes almost as much as their furry companion. Create a precious keepsake with the Better World Pets Furever Memorial and preserve your beloved dog’s paw print in the clay, which you can then display inside the memorial’s frame. As well as the clay keepsake, there’s also a frame for a lovely photo of your hairy companion. By purchasing this awesome shirt, not only will you be repping the cute senior doggies out there, but you’ll also be helping them, as the sellers, Save-A-Mutt, work with their local shelters to help senior pups get fostered by paying for their medical testing, which assesses their health to be adopted. 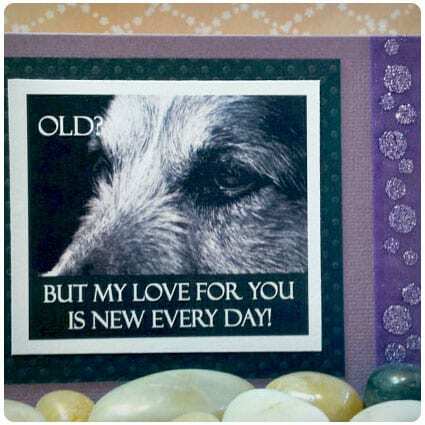 Owners of older dogs are sure to love this ever-so-sweet greeting card from RileysStar on Etsy. This purple card is decorated beautifully with ribbon, and has a charming black & white picture of a dog and reads “old? But my love for you is new every day!” which is incredibly adorable. Give the grey and senior pups of the world some much-needed love with this seriously cool hand-printed “old dog are the best dogs” oversized slouchy v-neck shirt. While puppies are definitely cute, older dogs definitely need recognition and attention too, they’re just as loyal (if not more), lovely and affectionate. They’re gone, but not forgotten, and you can help keep their memories alive with this heartwarming personalized mug. The mug has “You left paw prints on my heart” printed on it, and you send a beautiful photo of your pet, which will then be added. Ready for you to use and keep forever. From Baby Mushroom comes the Ultimate Pet Pawprint Keepsake Kit and Picture Frame. The kit comes with everything you’ll need to create it: air-drying pet-safe clay, alphabet and number stencils to add their names and birth dates, and of course the beautiful wooden picture frame which comes with a mounting bracket. You can now keep your beloved four-legged friends paw print forever with the Pearhead Keepsake Ornament Round. Simply roll out the clay (using the included rolling pin and mold) press your pets paw into it, insert your chosen ribbon, wait for it to fully dry, and then it is ready to hang wherever you like.